Not long ago, U.S. Army forces in the Pacific spent most of their training time preparing for humanitarian relief missions, evacuations from natural disasters, and efforts to build up allied security forces. Not anymore. Since President Donald Trump has come to office, the administration has issued a new National Security Strategy focused on the persistent potential for military conflict with China and North Korea. The Army has shifted gears accordingly. Interoperability is Army-speak for how well different countries’ militaries can fight together. On cable TV, a notional U.S. conflict with China or North Korea is often talked about as if it would be a bilateral battle. That’s not the case, commanders stress, and that’s not how the Army is training. “We know we not going to fight unilaterally anymore,” said Lt. Gen. Gary Volesky, who leads the Army’s I Corps. So their Pacific Pathways training program with foreign militaries is designed to find gaps between each one’s capabilities and address them. Today’s training means more attacks, more live fires with company and battalion levels, and more of it with foreign counterparts. Previously, the Army would to go country-to-country for shorter training visits, but now have modified those programs to stay longer in each country for deeper training specific to fighting. “It’s really focusing on those warfighting tasks,” Volesky said. Flynn, who has served as deputy commander of U.S. Army Pacific and led the 25th Infantry Division, gave an example. The first time an American helicopter aircrew deploys to a new country, it takes roughly 24 to 36 hours to set up operations. But by their third country, it’s more like two hours. The pace is quick. Besides the overseas training with allies, soldiers spend time in classrooms and at domestic venues such as the Army’s National Training Center in California. “It’s pretty busy,” Volesky said. Volesky’s I Corps is unique; the Army has never before assigned an entire corps to one geographic region. The assignment shows the Pentagon’s seriousness about being ready to fight a major war in the Pacific. Another data point: 20 percent of the Army is currently assigned to U.S. Indo-Pacific Command, Flynn said. So just how ready is the Army? During his presidential campaign, Trump said the the military had atrophied and pledged to “rebuild” by adding billions of dollars for new and modernized equipment. 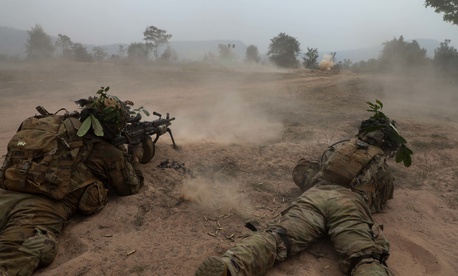 Some observers — especially some conservatives — sided with Trump, politicians, and Army leaders, citing various statistics to argue that the service needed more troops, new gear, and a larger budget. Others, like Pulitzer Prize-winning veteran reporter David Wood, disputed the president’s claim and chronicled how the Army had by 2016 shifted its focus, after a generation of counterinsurgency fighting, towards preparing for — and deterring — great-power conflict. The new focus is not unique to the Pacific. It’s a service-wide shift. “The Army is back into doing gunneries on a routine basis. Artillery units are back into doing mass fires. Attack aviation units are back into doing significant aviation operations and air assault operations and so on. So, across the board, across the entire Army, there has been a refocus,” said Milley, as quoted by Army Times.